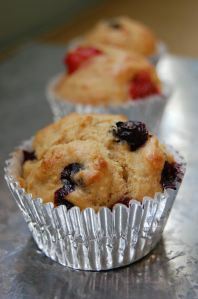 Daniel woke up this morning and one of the first things he said was "BLUEBERRY MUFFINS!" If you have ever heard Daniel get excited - you know how loud it was and he had not left the bed. Then he ate one. Let me just say this is a MAJOR hit with him. Jon said they were really good, but that the blueberries were not good for his stomach (this is typical for his reflux and fruit). We agreed to try apples/ applesause or banana next time - they do not bother him. Scott and I both love them also. For breakfast this morning, I made 1/2 cup egg whites (with my olive oil), strawberries and a blueberry muffin - for a 6 point plus breakfast with 2 fruit servings and my healthy oil already taken care of for today.